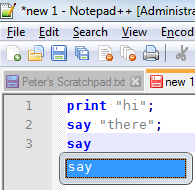 Seems Notepad++ only support Perl5.8, for example: “print” is a keyword, but “say” is not. 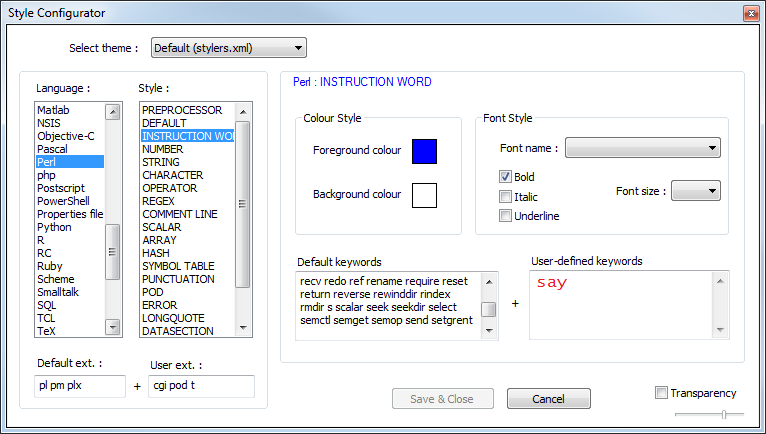 “say” is available since Perl5.10 ( http://perldoc.perl.org/functions/say.html ). Perl6 is not supported also. Can I add keyword into notepad++ myself? How? To add a keyword yourself to syntax highlighting, use Settings > Style Configurator > Language = Perl > Style = INSTRUCTION WORD > User-defined keywords = say, then Save & Close. As far as Perl6: you could just add keywords on top of Perl5… but some argue it’s a whole different language, and should thus get its own lexer. I don’t know if there’s a Perl6 lexer for Scintilla yet, but it’s definitely not yet included with the Scintilla that NPP uses. Alternatively, if you don’t need the complex aspects of the syntax highlighting, you might be able to get away with a User Defined Language (UDL) thru Language > Define Your Language. You can see the UDL 2.1 documentation at http://ivan-radic.github.io/udl-documentation/.